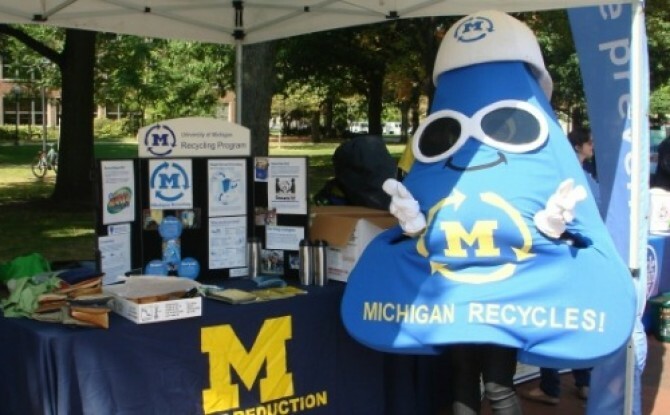 Every year since the University of Michigan’s first Green Cleaning Award – Honorable Mention win in 2011, the Plant & Ground Services department has been steadily growing its green cleaning program. In 2012 they won another Honorable Mention, in 2013 they won Silver and in 2014, they scored First Place. Today UM has a program with an 80 percent decrease in chemical usage, efficient green cleaning procedures, streamlined training and a staff that is proud to be cleaning for health. We continue to be impressed by the department’s progress. They are also a great example of how a program can keep pushing itself to achieve more, and how applying for the Green Cleaning Award can help to benchmark a school’s achievements. Last year was the final one in the school’s five-year rollout of its OS1 program. The department has also been focusing on some innovative approaches to greener floor care since their last Green Cleaning Award. They are piloting stone polishing floors instead of using traditional stripping and waxing techniques and encouraging campuses to adopt more durable floors finishes. They’ve also been working to encourage pride and elevate the status of custodial staff in the larger campus environment — and beyond. One of the ways the department has been spreading the word about its cleaning program is through video. They won a Silver Telly Award in 2013 for A Short History of the Custodian, which has more than 4,000 views on YouTube. “I’m reminded of a story of a reporter in the NASA space center,” recalls an interviewee in the video. “He came upon a custodian, and he asked him what he did and the custodian said, ‘I help send astronauts to the moon.’” After watching this video, you really get the feeling that UM believes deeply in the importance of the work its custodial staff is doing, and that the students understand the role cleaning plays in their education. The documentary style video features historical information, interviews with students about the role that cleanliness plays in their studies and campus health professionals discussing the science behind cleaning. A second video explains the Plant and Ground Services department’s management system and focus on cleaning for health first. The school plays both videos in lobbies and lounge areas throughout campus. These videos, along with streamlined management systems and a strong focus on cleaning for health have really helped to create a sense of pride in the custodial staff at UM. Is your school interested in being recognized for excellence in green cleaning? Apply now.